Five persons were killed and several others injured in security forces action against stone-pelting protesters in Budgam and Anantnag districts of Kashmir on Tuesday where normal life remained paralysed for the 39th consecutive day due to curfew, restrictions and separatist-sponsored strike. With the fresh deaths, the toll in the ongoing unrest in the Valley has now gone up to 63. Four persons were killed in Central Reserve Police Force firing on stone-pelting protesters in Aripathan area of Magam in Budgam district while five others were injured, a police official said. The deceased have been identified as Javaid Ahmad, Manzoor Ahmad, Mohammad Ashraf and Kauser Sheikh, he said. The incident took place when a group of protesters hurled stones at a passing CRPF vehicle on Tuesday morning. 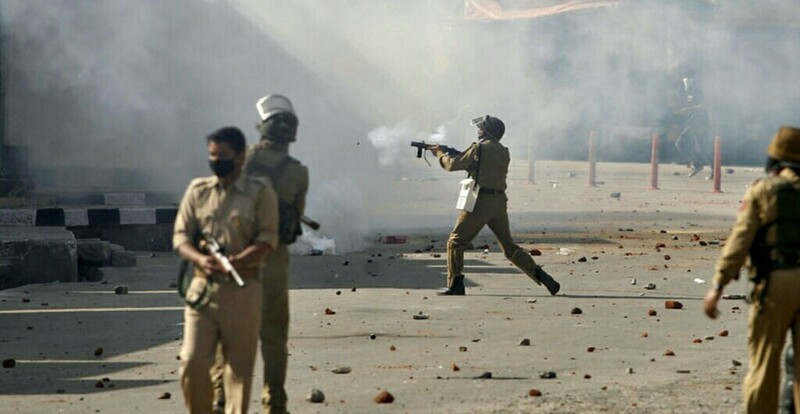 In another incident at Janglat Mandi in Anantnag district, five persons were injured when security forces opened fire to disperse a stone-pelting group of youth, the official said. He said one of the injured — Amir Yousuf — succumbed to his injuries. Meanwhile, curfew remained in force in entire Srinagar district and Anantnag town while restrictions were in place in rest of the Valley as normal life remained paralysed for the 39th consecutive day. The official said curfew and restrictions were imposed to thwart the plans of separatists to organise sit-in protest by traders against the civilian killings at main market places of the Valley. “Curfew remained in force in entire Srinagar district and Anantnag town in south Kashmir as a precautionary measure to maintain law and order,” the police official said. The attendance in government offices was thin. Internet and mobile services across the Valley remained suspended. While broadband services were snapped on Saturday evening, the mobile telephony was suspended late in the night on the same day. Normal life has been affected due to protests against the killing of Hizbul Mujahideen commander Burhan Wani in an encounter with security forces on July 8. The separatist camp is spearheading the protests in the Valley over the civilian killings during the protests against Wani’s killing. As many as 62 persons including two cops have been killed and several thousand others have been injured in the clashes that began on July 9. Meanwhile, former chief minister Omar Abdullah lashed out at the Centre for raising the issue of Balochistan at a time when Kashmir has been hit by violence. “Six protesters dead in Kashmir in 24 hours but WTH let’s go sort out Balochistan since we are doing such a good job in J&K at the moment!” Omar wrote on Twitter. Following the all-party meeting chaired by Prime Minister Narendra Modi on August 12, the Centre decided to raise the issue of human rights violations in Balochistan province of Pakistan. The PM also referred to Balochistan in his Independence Day speech on Monday.